Services | McDonald Custom Builders Inc.McDonald Custom Builders Inc. The right contractor offers substantial construction experience, integrity, and a commitment to your project supported by a foundation of quality and workplace safety. The right contractor also has a consistent track record of coming through for first-time and repeat clients, no matter the project size or complexity. You can trust the MCB family to be that contractor. We endeavor to construct buildings of quality and have made it a goal to construct them efficiently. Honesty and ethical behavior with our clients, contractors and suppliers is a priority. Satisfying client goals is our focus. Typically a client retains an architect or engineer to design the project and to prepare the necessary drawings and specifications. After the architect/engineer completes the drawings and issues them for pricing, the client will then select the general contractor through a sole source or a competitive bid process. Once awarded a project, MCB works collaboratively to bring all project team members together as a cohesive unit (ie architect, engineer, surveyor and designer) in preparation for the first phase of construction. This helps foster a more successful and productive partnership. We continue to work alongside the architects, engineers, surveyor and design team as well as the sub-trades and suppliers throughout construction. Early collaboration in the construction management process promotes effective project coordination and communication from the start, creating an environment for success. MCB has built for several major Architectural companies based in, but not limited to: Toronto, Huntsville and Oakville whose styles of buildings range from extremely modern to ‘rustic’ cottage. We have a comprehensive and diverse skill set and we are confident in our ability to execute any design – this makes our job that much more fun! Our construction management expertise in the areas of construction costs, schedule, and market trends help ensure the project is executed within both client timelines and budget guidelines. We are focused on workmanship and quality service, and take pride in our approach to careful planning and critical execution. We provide advice on all project costs, minimizing the risk associated with having an incomplete scope of work during preconstruction, and more often than not, throughout construction. The final cost however, remains with the client as we ensure the budget is client driven. Our crew is capable of all aspects of carpentry (ranging from rough carpentry to detailed interior finishes). Often times, the most valuable use of our labour force is to facilitate the sub-trades making the best use of their time and moving the project along quickly. We don’t work exclusively with any one trade nor do we employ directly any trades. We tend to keep relationships with several businesses per trade as requirements tend to vary greatly from job to job and are dependent upon not only the size of the job, but also the complexity of the work involved and price point. We generally outsource demolition, blasting and excavation, foundation, roofing, insulation, masonry, mechanical systems, painting, tile/floor installation and millwork. MCB places a heavy focus well into the weeks and months following construction to ensure all aspects of the project have been completed as agreed and that our client’s expectations have been met, if not exceeded. MCB considers Post Construction services of equal importance as the build itself. Customers are the assets of every business. 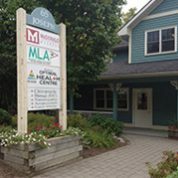 65 Joseph Street, Port Carling ON Located downtown in the heart of Port Carling, our office can easily be found next door to the Home Hardware. McDonald Custom Builders Inc are proud sponsors of: Carter’s Forever Dog Rescue and Sanctuary, Northern Rescue Drivers, Freedom Drivers, Muskoka’s Boat Rally and the Rally for Kids with Cancer Scavenger Cup SickKids Foundation, the Port Carling Figure Skating Club, Mactier’s Community Festival, Port Carling’s Winterfest, Mactier’s Mens Hockey Club and the Tyke Select South Muskoka Bears. Our three acre yard centrally located near Port Carling with full video surveillance is equipped with a comprehensive woodworking shop, a separate heated building for paint/stain application and a third building for safe and dry material storage. We strive to work efficiently and understand the importance of timing as it pertains to both our company and more importantly, our clients. The yard allows us to be pro-active on tasks necessary for timely on-site delivery of materials that are custom pre-finished or pre-manufactured, to meet our client’s high expectations.